Peanut Plant Research Papers discuss where this plant originated and how it develops. Research papers on the peanut plant can cover the agricultural aspects of the plant or focus on the history of the peanut plant in other societies. The peanut plant is a staple of some societies; learn how this plant influences the world anthropologically by ordering a custom research paper that focuses on exacty what you need to know about this interesting legume. Though many of the common names include the word “nut,” Arachis hypogaea is not a true nut. According to the Encyclopedia Britannica, it belongs to the family Fabaceae, order Fables, Subclass Rosidae. Other categorical listings given for the peanut include Leguminosae and Pappilionidae. In any case, the peanut plant is a legume belonging to the bean, pea, and clover family. The peanut plant exists as both a bushy and a creeping annual, with many instances in which there is an intermediate manifestation. An unusual characteristic is that the plant flowers above the soil but fruits below it. 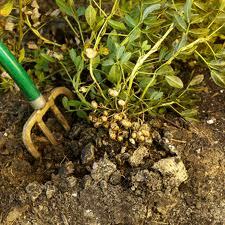 As Arachis hypogaea becomes established and starts to grow, small yellow flowers appear in the lower part of the plant. They are complete, perfect, and hypogynous. Additionally, the flower is cleistogamous, or self-pollinating. After pollination has occurred, the flowers lose their petals as the fertilized ovary grows larger. The enlarged ovary, or peg, grows downward, forming a small stem which extends to the soil. The tip of the peg penetrates the soil, and the embryonic fruit continues to develop as a subterranean pod. The fruits actually function as roots to a certain extent in that they absorb mineral nutrients directly from the soil. As with other leguminous plants, pods of Arachis hypogaea develop from a single carpel and separate along both sutures. The fruits are categorized as dry and dehiscent. Most sources suggest that the peanut plant originated in Brazil or Peru. However, no fossil records are available for substantiation. South American pottery dating as early as 3500 years ago was made in the shape of a peanut and is often decorated with a peanut motif. Explorers took the plant back to Spain, and from there it was introduced into Africa and Asia. Africans who came to North America as slaves brought the peanut plant with them. In fact, the word “goober” comes from the term used in the Congo to denote the peanut, nguba. Paper Masters writes custom research papers on Peanut Plant and discuss where this plant originated and how it develops.